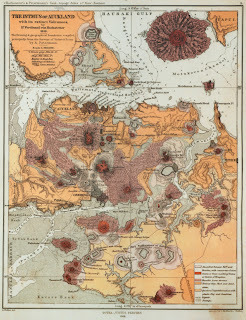 1850 map of Auckland Isthmus and volcanic field. Location map showing Auckland basaltic cones and maar craters. As we know, Auckland sits upon a vast [largely active] volcanic field. It is the geomorphic setting that has shapped the region and the isthmus. I have become interested in the water bodies [maar craters] that were formed by volcanic activity, therefore a part of the network of the volcanic field. This is a possible area of investigation. Apart from the visual markers of our geological history [that being the volcanos dotted around Auckland], we can also acknowledge - and make connections with - the formation of areas of the coastline and subsequent bodies of water as a result of volcanic activities. THEREFORE: potentially allowing the mechanism for the formation of our region and natural landmarks to speak to another realm of urban interaction with landscape, that being the water-bodies of the maar craters.